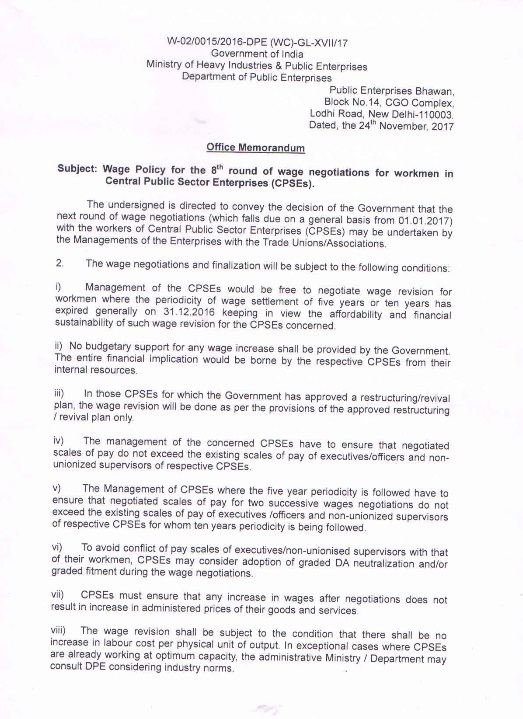 i) Management of the CPSEs would be free to negotiate wage revision for workmen where the periodicity of wage settlement of five years or ten years has expired generally on 31.12.2016 keeping in view the affordability and financial sustainability of such wage revision for the CPSEs concerned. ii) No budgetary support for any wage increase shall be provided by the Government. The entire financial implication would be borne by the respective CPSEs from their internal resources. iii) In those CPSEs for which the Government has approved a restructuring/revival plan, the wage revision will be done as per the provisions of the approved restructuring revival plan only. iv) The management of the concerned CPSEs have to ensure that negotiated scales of pay do not exceed the existing scales of pay of executives/officers and non-unionized supervisors of respective CPSEs. v) The Management of CPSEs where the five year periodicity is followed have to ensure that negotiated scales of pay for two successive wages negotiations do not exceed the existing scales of pay of executives /officers and non-unionized supervisors of respective CPSEs for whom ten years periodicity is being followed. vi) To avoid conflict of pay scales of executives/non-unionised supervisors with that of their workmen, CPSEs may consider adoption of graded DA neutralization and/or graded fitment during the wage negotiations. vii) CPSEs must ensure that any increase in wages after negotiations does not I result in increase in administered prices of their goods and services. viii) The wage revision shall be subject to the condition that there shall be no increase in labour cost per physical unit of output. 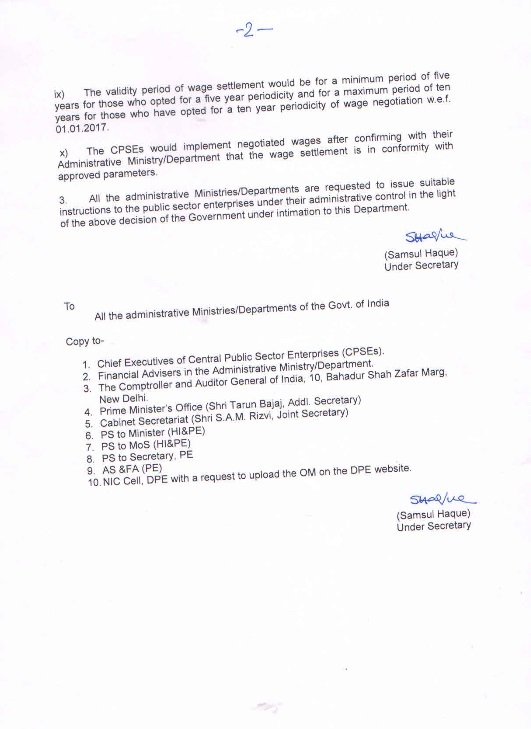 In exceptional cases where CPSEs are already working at optimum capacity, the administrative Ministry / Department may consult DPE considering industry norms. ix) The validity period of wage settlement would be for a minimum period of five years for those who opted for a five year periodicity and for a maximum period of ten years for those who have opted for a ten year periodicity of wage negotiation w.e.f. 01.01.2017.
x) The CPSEs would implement negotiated wages after confirming with their Administrative Ministry/Department that the wage settlement is in conformity with approved parameters. 3. All the administrative Ministries/Departments are requested to issue suitable instructions to the public sector enterprises under their administrative control in the light of the above decision of the Government under intimation to this Department.